This soft, light sandwich loaf is the 18th bread I’ve baked for The Bread Baker’s Apprentice Challenge. Yes, I’m slowly but surely plowing through the book, and although there are still 28 breads ahead of me, I am confident I will finish the book…eventually! 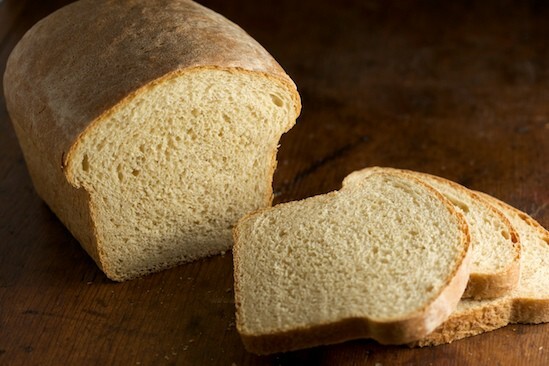 Mr. Reinhart’s Light Wheat Bread was definitely a crowd pleaser – easy to make, easy to eat, and not too bad to look at, either. 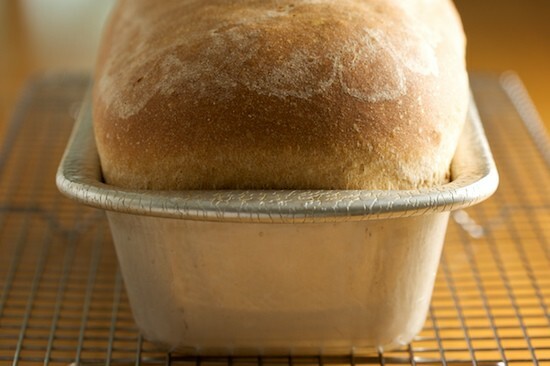 The proud loaf that came out of my oven puts store-bought sandwich bread to shame and the simple formula is perfect for beginning bread bakers. 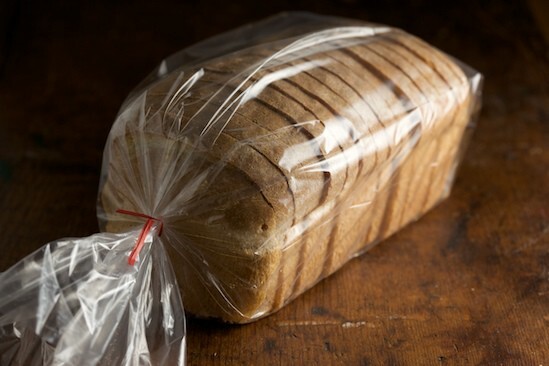 Although I have many fond memories of my mom’s homemade whole wheat bread, the truth is that I grew up, as many Americans did, eating sack lunches filled with peanut butter and jelly sandwiches on store-bought sandwich bread. And while I do bake a lot of bread, I still find myself grabbing loaves of whole wheat bread off the supermarket shelf for sandwiches. I hate doing that. Store-bought breads can’t hold a candle to homemade, and most of them are so filled with additives and preservatives they can hardly be classified as bread. So I am really trying to get in the habit of baking sandwich loaves on a regular basis again. With a little planning, and some extra freezer space, it should be manageable. I know I won’t convince all of you that it’s feasible to bake your own sandwich breads every week. But I do believe that every one of you should try baking your own bread at least once. It’s not difficult. Yes, it does take time, but most of that time is hands-off, allowing you to do other things around the house – watch a movie, do laundry, spend time with your family, or just lounge around in your pajamas (I’m a big fan of baking bread in my pajamas). Do you ever spend an afternoon at home on the weekend? I bet you can fit some bread baking in there and even have fun doing it. So let me tell you a little bit about this light wheat bread. It’s called “light” because whole wheat flour only accounts for about a third of the total flour in the recipe – the rest is unbleached bread flour. While it’s not even close to 100% whole wheat bread, it’s heartier and more flavorful than a white sandwich loaf. The ingredients are simple: bread flour, whole wheat flour, honey, salt, powdered milk, yeast, butter and water… and the dough is easy to mix and knead by hand. The dough was a pleasure to work with, and as you can see from the photos, it rose like a champ. The formula produces only one loaf, but next time I’ll probably double it. Sandwich bread freezes beautifully so it’s always nice to have an extra loaf to pop in the freezer. Although I don’t reprint the recipes from Mr. Reinhart’s book, Deb at Smitten Kitchen wrote about this bread last year, including the recipe. 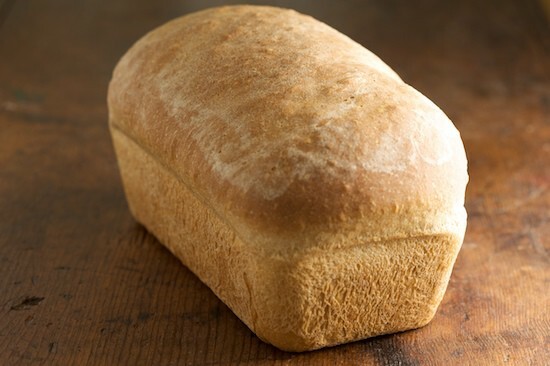 If you’re a beginning baker this bread is a great place to start, and I encourage you to give it a try yourself. If you’re following along in the challenge, the recipe can be found on page 181 of The Bread Baker’s Apprentice. The next bread is Marbled Rye, which will be the first rye bread I’ve ever made. Exciting! Want to Join The Bread Baker’s Apprentice Challenge? There are several ways for you to join in the fun! First of all, you need a copy of Peter Reinhart’s The Bread Baker’s Apprentice. Read the first section of the book carefully, as this will prepare you for the bread recipes in the second section of the book. Then just jump in and bake some Anadama Bread, which is the first bread formula in the book. You may also visit The BBA Challenge Page for more details on how to participate in the group. Oh, look how beautifully it rose. Mine got about 1/2 that tall above the pan and then collapsed in the oven. I *just* got done posting my partial whole wheat bread results when your post came up in my feed. I used to get whole wheat bread from Whole Foods, but after we moved we discovered our local bread is just as artificial as most store bought bread, which was a bummer. Thankfully I adore baking, so I've gotten back into the once a week habit again. http://photoblog.alexremy.com/2010/02/whole-wheat-sandwich-bread.html Your bread is gorgeous! What a gorgeous loaf of bread! How in the world did you get such even slices? Beautiful loaf, and very nice write up! I thought fondly of this bread when I made the less-than-stellar 100% whole wheat bread toward the end of the book. Wow what stunning photos! This bread looks beautiful! I used to make a loaf of sandwich bread every week, but it got tedious cutting it into slices. So now, I take the same dough recipe that I used before and shape /rolls/ with it instead. I just take it from the freezer, pop it in a plastic bag, go off to work, and then I can cut it open at lunch time for perfectly portioned sandwiches. There are fewer crumbs too. How did you manage to get nice even slices? That's one of the worries I have about making sandwich bread at home! You can buy a bread slicing guide that will ensure nice, even slices. But I've found that nothing beats a really good bread knife and lots of practice. Looks great! I've found that letting whole wheat bread rise a whole lot--multiple times during the whole process--helps it become lighter. Lovely pictures, too! It is so great that you are working your way through the book! I applaud you. I recently made bread after a very long break and it was so good and I had so much fun making it - I'll be doing it again soon. I've made this recipe many many times now, reduced to 2/3 so as to work in my bread machine (I use a scale with gram measures to get the measurements right) -- perfect every time. This week for the first time I made the full recipe and baked it in the oven (though I used the machine to do the mixing and kneading) and it came out OK (not quite the final rise you got). So -- for me it's better in the bread machine, and way easier too. For those who try to bake all their family bread, and who have a bread machine, and who want a healthy bread that won't 'offend' picky eaters (children), this is an excellent everyday bread. I've got to try this. thanks-Looks really amazing! wow, amazing bread baking!! how did you get such a professional looking result? i've only seen bread bags at king arthur's flour and they were incredibly expensive. ditto on the slices! did you use a guide? Gorgeous loaf! Mine looked nice, too, but I wasn't too excited about the flavor. I should have used more whole wheat flour, I think. HEY... I just made my first loaf of bread from teh book. So far behind, not going to join, but great book and great that you are doing them all! Great bread and yes it was easy compared to some of the others. But it was a joy to clean up after! Your bread looks fantastic! I love making bread, but do not have time to make it as often as you. Great job. This bread looks magnificent. One weekend I will have to try to make this. I could use if for sami's all week, rather then simply buying some at the store! I never tried a light wheat bread before but looking at the pictures and after reading your article about it, I am curious to try and make one for myself. I just received BBA as a gift and I'm super excited to try baking with it. One trick I have found to make homemade sandwich bread more reasonable is to make sourdough bread. I get two giant loaves out of it (granted, they're not shaped exactly like storebought bread, but I think it's more fun that way) and we can use them for two weeks. That way, I bake sandwich bread one week and a different fun bread on the off weeks. I skipped ahead a few breads... ok a LOT of breads, to make this one because I HATE store bought bread with a white hot passion. I love this bread! We split it into 2 1 pound loaves. I've found that I have to knead it a bit more than the book states to get the proper window. OMG ! these bread is the best ! me and my hubby gave a try and no regrets ! delicious !!! all our friends love it as well !!! great, great recipe and so easy to follow !!! thank you ! I borrowed this book from the library and have attempted to make several different loaves from it. Not sure how far into the book this recipe is, but I'm very interested for your posts when you get to the sourdoughs. After two failed attempts, I think I have to give up for a little while. This is a wonderful book though, and a fantastic idea! Light Wheat bread, my favorite! Has many anti-disease / fighting properties. I have been making my own bread for about six months now. I have stopped buying bread from the store. As you stated so well homemade bread is SO MUCH better and the hands off time is wonderful for getting other things done. This recipe is similar to my go-to "wheat" recipe. I need to check out the rest of your bread recipes! !